I have issue with task managers – it is called Process Explorer. Whatever specific task manager does it is safe bet that Process Explorer does more and better. I had updated version for Auslogics Task Manager at Appnews some time ago (Martin had posted about it at ghacks) and downloaded to check out at leisure. So here it is – task manager /viewer/security tool blend. App is task manager that adds management for few related things, simple performance monitor and security assessment. Interface is light and streamlined with fixed sidebar and classic multi-column info area. Sidebar shows info and available actions for selected item. Functions are convenient but limited to basics. App is also very happy to send you off to File Inspect Library site that acts as encyclopedia for trustworthiness ratings in interface. Auslogics Task Manager feels like Process Explorer, Opened Files View and Unlocker mixed, boiled and limited to single spoon serving. It is a pleasure to use for overview but actual management part is shallow. Task Manager is not an ultimate tool and doesn’t try to be one. More like non-geek version of more powerful utilities. It may fit into family install, but if you are seriously into this stuff you are better off using serious tools. I’m those how like more on-geek :) version from this utility, I actually use System Explorer but, do you know more advanced Task Manager replacements? I’ve notified Auslogics of the problem when asked why removing their software, still waiting for their acknowledgment. Quite true, Rarst, Applications Panel isn’t essential, but nevertheless why doesn’t it work? It shows more than applications that currently have visible windows, for instance I run the software Hostsman, and both of its modules appear in Applications Panel in Windows Task Manager (‘HostsMan’ and ‘HostsServer Control Panel’), they do have windows, but hidden. 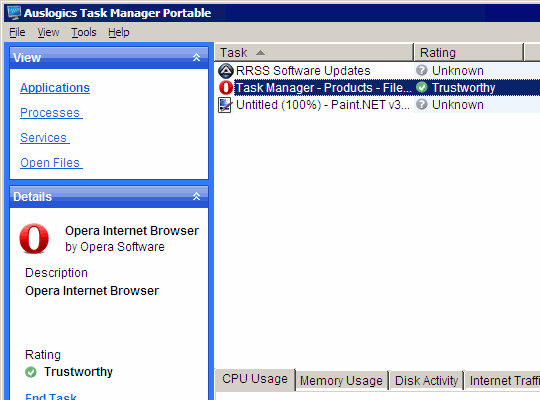 @Rarst: Process Explorer, I don’t like so much, I mean others advanced task managers replacements. Sorry, I struggled myself but in the end Process Explorer is ultimate stuff. :) Took me some time to ignore overly technical parts that I have no clue about. A rather mundane applet with nothing really unique to recommend it. a little harder to use. Yep, that stuff got much improved in Vista. Not that I use Vista, so have to settle for Process Explorer. I guess most of us are aware of latest “Process Hacker” Process Manager ( http://processhacker.sourceforge.net/ ). This is something, perhaps the most elaborated Process Manager I’ve encountered, installs on demand as a service, deals deep in the Kernel, has authority on whatever anti-virus as well as nasty nests :) But I’d use 10% of its potential, this is a geek business! Bookmarked to check out. :) Will see how it compares to Process Explorer. “Process Hacker” requires .Net Framework 2.0 by the way. Iy is gorgeous, has a stable release but remains in development.